Australians have always felt uncertain about their place in the world. As a transplanted, predominantly European, society situated within Asia, Australians have always felt a sense of threat from the north. Profound differences with the nations of East Asia exist in nearly every respect: race, history, culture, social structure and population density. Within this region, Australia is truly an oddity. It should be no surprise, therefore, that security issues have always dominated Australian foreign policy. Separated by vast distances from other rich, English-speaking, and predominantly white, nations such as Britain, the US, and Canada, Australians feel an acute sense of isolation in this region, like a 'continent adrift', or a mere 'province of the English-speaking world'. An Australia highly threatened and highly desired, militarily defenceless and driven into alliances with 'great and powerful' friends, has been the underpinning of Australian foreign policy from the 19th century to the 1970's. However it has been suggested that this attitude is more one of perception that reality, as apart from the Japanese challenge which grazed several small towns on the north coast of the country more than 50 years ago, Australia has never experienced military attack. Leaver (1997) postulates that Australian security is not so much threatened from any specific enemy, but rather from the possibility that known and understood arrangements with existing allies would break down. It is indeed security issues that have determined Australia's active role in the UN, within East Asia, and with the United States; however, for more than a decade it has been security defined broadly, and not military security issues alone. Within the Australian context 'security' has meant the territorial integrity of the Australian landmass from military threat from the north, and the maintenance of stability in neighbour states. In realist discussions of international relations 'security' and 'military security' are regarded as almost synonymous. However concepts of security, especially since the end of the Cold War, have now broadened to encompass a much broader agenda, to include among other things, issues such as the environment, economic and cultural globalisation, and human rights. These non-military issues demand a multilateral approach utilising international organisations, such as the UN, WTO, the World Bank and IMF, Amnesty International, just to name a few, and international agreements, such as the International Covenant on Civil and Political Rights and the Framework Convention for Climate Change. The realist approach, with its emphasis on alliances and military power, does not provide a complete perspective for the needs of the 21st century and new perspectives must take into account a much broader range of issues that affect international security, and not simply geopolitical strategic issues by themselves. Narrow focus on 'national security' can tend to obscure other dimensions of foreign policy. Horner (1997) contends that focus on non-military issues such as disarmament, trade, environment, immigration, and reform of the UN have done more to enhance Australia's security than specific defence policies. If, as former Foreign Minister Gareth Evans contended in December 1989, the first duty of the Australian government is the 'protection of our physical integrity ... from armed attack', then the way to achieve this is not merely though military strategy alone, but by addressing the issues which lead to conflict. Evan's went on to cite the main priorities for Australian foreign policy which consisted of: pursing trade, investment and economic co-operation; contributing to global security and to the cause of 'good international citizenship'; and, maintaining a positive security and strategic environment. For all the changes that have occurred within Australia and the world for the past half-century since the signing of the ANZUS treaty in 1951, the American military alliance and the Western strategic community remain the 'essential pillars' of Australian foreign policy. Any changes that have occurred within the expression of Australian foreign policy over the years since 1951 have essentially been at the margins; the central tenant has remained unchallenged to this day. When New Zealand effectively took itself out of ANZUS in 1984 the alliance was deprived of some crucial consonants, thus nowadays the term 'alliance' or 'American alliance'' is used rather than 'ANZUS alliance'. In fact the American alliance relationship consists of more than just the ANZUS treaty; it is a long-standing wider pattern of military co-operation of which only some elements have been formalised in treaties and agreements. The overall Australia-US relationship has never been completely smooth. Trade disputes in particular have frequently intervened to threaten the relationship. Despite this no Australian government has (openly at least) used the security relationship as a 'bargaining chip' to gain leverage in these disputes. This perhaps demonstrates the high level of importance Australian governments give to this relationship despite these occasionally bitter disagreements about US trade policy and its impact on the Australian economy. 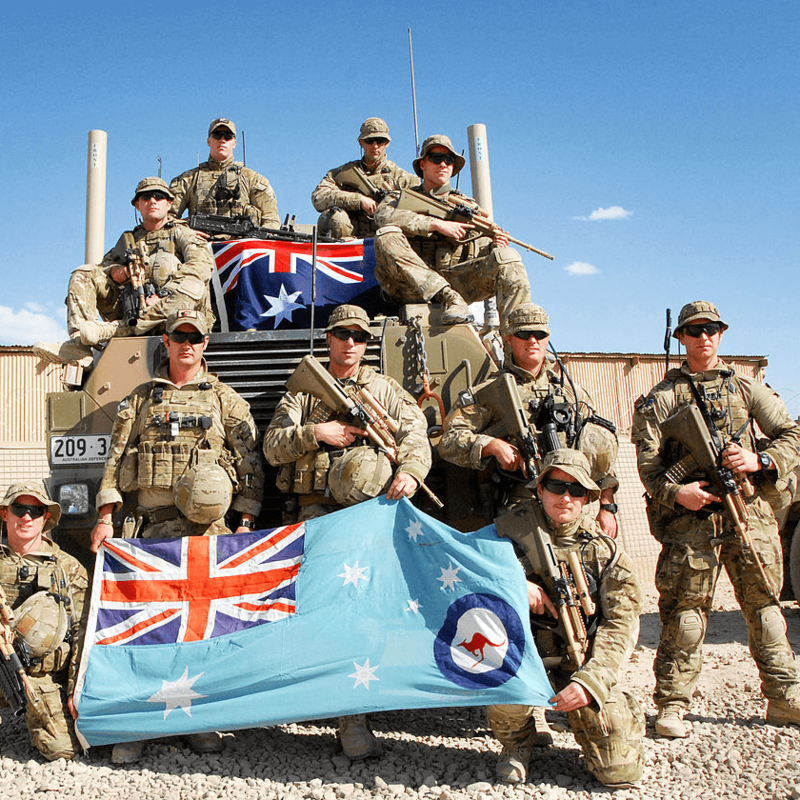 What has changed in the relationship since the formal alliance was entered into more than 50 years ago has been Australia's posture in relation to its own defence. Up until the mid-70's the concept of 'forward defence' dominated the defence outlook of Australian policy makers. Taking the view that Australia, with its low population density and long coasts, was basically 'indefensible', forward defence meant the deployment of forces across the approaches to Australia in order prevent an enemy ever reaching Australia. In 1955 PM Menzies declared that Australia should be defended 'as far from our own shores as possible'. This concept was compatible with the pre-existing Australian concept of achieving security through alliances. All forward deployment of Australian forces have been done within the context of an alliance with either the US or Britain. Forward defence within the American alliance has meant that Australia has frequently had to involve itself in disputes far from our shores in order to support US political objectives, Korea and Vietnam being examples. This involvement and support has been given with the open purpose of paying an 'insurance premium' to the US to guarantee military support should Australia ever face threat. This has meant that the structure of Australian defence forces, their hardware and protocols, need to be compatible with that of the senior ally, in order to maximise interoperability. Defence and foreign policy too, needed to be subordinated to a great degree. On the positive side the policy of forward defence was relatively cheap in that Australia did not have to maintain large armed forces. The enunciation of the Guam Doctrine by President Nixon in 1969, and the outcome of the Vietnam War in 1975, forced a rethink concerning the policy of forward defence. In November 1976 a new approach to Australia's defence was articulated in a government White Paper, which argued that Australia should be more self-reliant and focus more attention on the regions adjacent to Australia. 'Self-reliance' did not, however, mean any significant diminution of Australia's commitment to the American alliance, but rather that Australia's independent capacity would be enhanced by US support. It was, however, another 10 years before this policy of self-reliance clarified. The Dibb report of 1986 more clearly expressed this self-reliance in the form of a policy of 'denial', and of 'layered defence', concluding that it was indeed possible for Australia to defend itself using its own resources. According to Dibb, the most important task was to ensure that an enemy would have difficulty crossing the air-sea gap to the north of Australia, and this would involve four layers of defence; intelligence and surveillance, longer range maritime forces, defensive capabilities close to Australian shores, and most significantly, ground forces capable of denying the enemy Australia's population centres and military installations. The need to secure the air-sea gap led to increased emphasis on defence co-operation programs with the countries of Southeast Asia. Australia's defence policy is not inward looking but rather seeks to be part of a regional security framework. However, despite all this concentration on self-reliance and regional co-operation, the American alliance remains central to Australian defence policy. Australia's burgeoning relationship with East Asia over the past few decades in particular has had a strong national security subtext. Australia now tends to seek security as part of the region; security within Asia, rather than from Asia. From its very beginning ASEAN was seen by Australian governments as a possible vehicle for security co-operation. ASEAN governments were initially resistant to this idea, and it was not until 1993 that a formal security dialogue became part of the ASEAN Post-ministerial Conference, becoming known as the ASEAN Regional Forum (ARF). Besides being tied into multilateral arrangements such as the ARF and the Five-Power Defence Arrangement, bilateral security relationships with the countries of Southeast Asia have also strengthened considerably over the past few years. Australia's relationship with the Singaporean defence forces is 'unusually close' with Australia providing access to air training facilities at the RAAF base at Pearce, WA and at Oakley in Queensland. In August 1995 the Philippines and Australia established a Joint Defence Co-operation Committee, making provision, among other things, for joint training and exercises, and personnel exchange. Probably the most significant security arrangement entered into by Australia for the past few decades was signed with Indonesia in December 1995. The Agreement on Maintaining Security requires regular consultation at ministerial level, with each party undertaking to consult with each other in the event of security problems affecting the parties. Indonesia has a closer defence relationship with Australia than any other country, including the US and ASEAN members. Whilst it is the American alliance, defence self-reliance, and regional security agreements that form the backbone of Australian defence strategy, it is within the UN and other international organisations that Australia attempts to address much broader issues aimed at improving global security, both military and non-military. As a middle power Australia has always been an enthusiastic supporter of the UN system and of the multilateralist approach to solving international problems. The Cold War, however, placed limitations on Australian multilateralism, and it was not really until the mid-80's that Australia started to emphasise multilateralism in its foreign policy approach, in particular in relation to world security and trade issues. Through the UN and other multilateral organisations Australia seeks to address security issues outside the scope of its territorial defence policy. Disarmament in particular has been a focus of Australian attention, such as the Comprehensive Test Ban Treaty, the extension of the Non-Proliferation Treaty, and the Chemical Weapons Convention. Australia has continued to make significant contributions both diplomatically and militarily to UN peacekeeping efforts. Of note, Australia played a leading role in the UN Transitional Authority in Cambodia by providing communications personnel and the Authority's military commander. Of current interest, and very much in Australia's backyard, the Australian government seems set to provide a large proportion of the police to be sent to East Timor to monitor the autonomy plebiscite in August 1999. Australia was and remains a country wracked by insecurity about its place in the world, and about its ability to protect itself from the increasingly powerful and unstable giants to the north. As I concluded in my previous essay the areas to the north of Australia will remain areas of instability for many decades to come. Civil strife, environmental catastrophe, and all-out war all have the potential to trigger huge population movement, and like gravity, the easiest direction is 'downwards' towards the 'empty' expanses and relative riches of Australia. Working to maintain regional stability therefore remains a critical objective of Australian foreign policy. For the past few decades Australia has been attempting to 'socialise' itself into the regional community, at the same time trying to obliterate memory of more than a century of standoffishness and outright racism towards Asia. Security issues - both military and non-military - drive Australian foreign policy and determine its activist role within the UN and international trade organisations. To a greater extent it also accounts for Australia's 'engagement' with East Asia. Lastly, it could be concluded that Australia's relationship with the US would be a good deal more cool and remote were it not for shared security interests.